Single sideband (SSB) is the most popular mode of voice transmission on the HF bands in ham radio. (FM is mainly used above 50 MHz.) The mode got its name from a key difference from the older mode, AM, which is used by AM broadcast stations and was the original voice mode that hams used. Most voice signals on HF are SSB, so you have to choose between USB upper sideband (USB) and lower sideband (LSB). 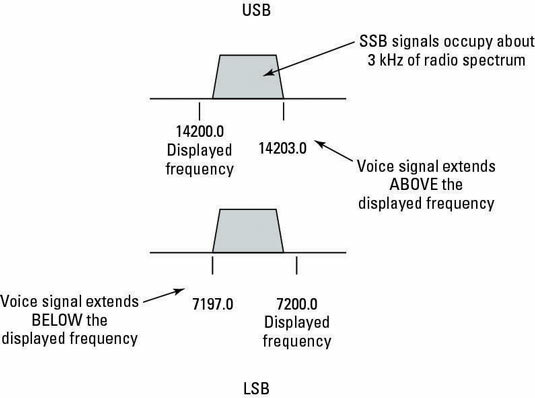 The actual SSB signals extend in a narrow band above (USB) or below (LSB) the carrier frequency displayed on the radio. How do you choose? By long tradition stemming from the design of the early sideband rigs, on the HF bands above 9 MHz, the convention is that voice operation takes place using USB. Below 9 MHz, you find everyone on LSB except (by FCC decree) on 60 meters. Because hams must keep all signals within the allocated bands, you need to remember where your signal is actually transmitted. Most voice signals occupy about 3 kHz of bandwidth. If the radio is set to USB, your signal appears on the air starting at the displayed frequency up to 3 kHz higher. Similarly, on LSB, the signal appears up to 3 kHz below the displayed frequency. When you’re operating close to the band edges, make sure that your signal stays in the allocated band. On 20 meters, for example, the highest frequency allowed for ham signals is 14.350 MHz. When transmitting a USB signal, you may tune your radio no higher than 14.350 MHz — 3 kHz = 14.347 MHz to keep all your signal inside the band and stay legal. If you tune across an AM signal that has both upper and lower sidebands, you can tune in the signal with either USB or LSB. The whistling noise that gets lower and lower in frequency as you tune in the voice is the AM carrier signal, centered precisely between the two voice sidebands. When the pitch of the carrier tone goes so low that you can’t hear it anymore, you can listen to either sideband by switching between USB and LSB. Set your rig to receive SSB signals. You may have to choose LSB or USB. Select the widest SSB filter. Adjust the tuning dial until you hear the SSB frequency. As you approach an SSB signal’s frequency, you hear either high-pitched crackling (like quacking) or low-pitched rumbling. You can tell from the rhythm that you’re listening to a human voice, but the words are unintelligible. What you’re hearing are the high- and low-frequency parts of the operator’s voice. Continue to tune until the voice sounds natural. If the voice sounds too bassy, your transmitted signal sounds too trebley to the receiving operator, and vice versa.